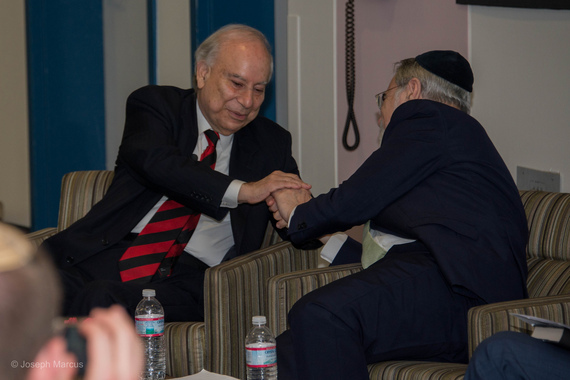 Ambassador Akbar Ahmed, left, and Lord Rabbi Jonathan Sacks, right, join hands in a moment of true admiration during their November 12 dialogue at American University on countering religious violence. Photo by Joseph Marcus, American University School of International Service. This past week, Paris, one of the great Western capitals, was rocked by a terrible tragedy. On a Friday night, 129 innocent people simply enjoying an evening out died at the hands of extremists who believed they were killing in the fight to avenge their people and “their” God. It was the worst attack in France since World War II, and it has left Europe feeling under siege. As we across the pond stand in solidarity with Paris and mourn the innocent victims of such hatred, how can such ruthless violence even begin to be checked? Thanks to a recent high-profile Jewish-Muslim dialogue though, a top Jewish scholar and a top Muslim scholar may have given us just the lesson or two needed to help humanity move forward. On November 12, American University (AU) had the honor of welcoming Lord Rabbi Jonathan Sacks, the former Chief Rabbi of the U.K., for a dialogue with Ambassador Akbar Ahmed, the Ibn Khaldun Chair of Islamic Studies at AU and the former Pakistani High Commissioner to the U.K. and Ireland, for a dialogue on countering religious violence. Named “two of the leading scholars of religions, two of the most exciting thinkers of our days and also two amazing spiritual leaders,” by moderator Professor Michael Brenner, the Seymour and Lillian Abensohn Chair in Israel Studies at AU, this dialogue not only talked the talk of Jewish-Muslim relations, but walked the walk.